Today I am suggesting a fun little book for Easter. 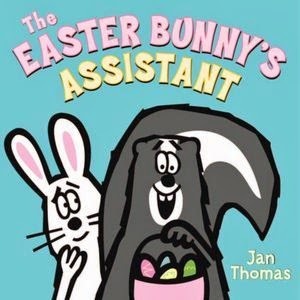 It is The Easter Bunny's Assistant by Jan Thomas. It is a really simple story about the Easter Bunny's assistant - Skunk - who, whenever he gets excited lets out a bad smell. I will be using this book in a few ways. One just for fun - it is simple but funny and we love funny. Also, I was at the library today (I am pretty much there every day, but today was a long one) and I ran across a few books that I love and grabbed for my class. If you have not checked these ones out you should - they are a great way to introduce or review grammar concepts. (Sorry for the bad pics - I have a to-do list a mile long and it is Sunday night already!!!) They are a If you were a series (do not fill in the blank with inappropriate words!!). They have great definitions and examples and super cute illustrations!! Okay, I have got to run, well hobble on my stupid ankle really, but I hope you had a great weekend and cleared off your to do list, HAHAHA! Hee Hee! I giggled when you said that skunk lets out a bad smell when he gets excited, so I can't imagine how the kiddos will react! Thanks for sharing! Oh how cute! I'm going to have to do this persuasive pack with my kids, they loved the elf one! What a great idea! And look at all of those fun grammar books! I've never seen those before! I will have to check those out too!! Thanks so much for linking up!! And you are never late! You have all week!! I love the cover on your persuasive writing pack. Looks so cute, and a fun activity, too! I have never seen this book. Looks like bunny love! Super cute...checking it out for sure! I will have to check out those books on grammar concepts. They look great! Thanks for sharing!